Often ground blinds are overlooked by hunters as a viable solution for successful hunting. Some seem to feel that it is cumbersome to carry a ground blind in, erect it, then to have to take it down, repack it, and carry it out. The advantages to using a ground blind far outweigh the slight inconvenience of carrying, setting up, and brushing in the ground blind and can be the difference between a harvest or taking a tag home. Ground blinds can be an advantage to hunters in many ways. The most important factor is concealment from the game animal hunted. Other factors add value to using ground blinds such as an ideal way to introduce youth hunters to hunting, setting up in a place that would be otherwise inaccessible for a hunt, and providing some shelter from possible rain, snow, or other weather conditions. There are several different styles of ground blinds available on the market from chair blinds to hub-style ground blinds in a variety of sizes for up to four people. Where spring steel ground blinds are the lightest, hub-style ground blinds offer the most durability and are a little more convenient to erect. What type of ground blind you choose is going to weigh greatly on your intended use. If multiple hunters or a cameraman and hunter are going to share the ground blind, a ground blind with a larger footprint will be more convenient. 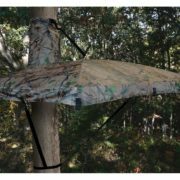 When the intended use it to carry the ground blind in for a days’ hunt, the hunter should look for features that offer a lightweight ground blind that incorporates a carry bag with straps. The floor size should be adequate to accommodate a foldable chair and the hunter’s gear allowing at least an 180 to a 270-degree view. A standard two-person ground blind is going to have approximately a 60” x 60” shooting width and anywhere from a 54” to 64” standing height similar to the Big Game Quantum ground blind. If room for a cameraman, additional gear, or an additional hunter is required, blinds similar to the Big Game Charger ground blind with a larger shooting width is ideal. Ground blinds are available in numerous exterior camo patterns, and It is typical for ground blinds to have a black-backed interior to help conceal the hunter inside. Where ground blinds differ in size and height, it is also important to consider the features. Ground blind window styles will vary in features, with quiet adjustability and ease of use being the most important. Ground blind companies incorporate a combination of elastic hook closures, elastic curtain bands, zippers, magnets, Velcro, and/or elastic cord slides used in conjunction with material screen and window panels made of the same exterior material. The design height of the window can vary and should always be considered for the type of hunting you plan to do. Many ground blinds are designed with elongated corner windows for bowhunting. The more viewing and shooting adjustability a ground blind offers, the more useful the ground blind will be to the hunter. A corner back panel is used for the entrance/exit panel that incorporates a zipper for access. When using a ground blind, a chair will be necessary and fully adjustable, swivel chairs work the best. There are several different styles of ground blind chairs available. If you are carrying a ground blind in for a hunt and plan to put it up at the beginning of your hunt and take it down at the end of your hunt, a small folding chair such as the triangle seat chairs will offer carrying convenience but does not offer extended sitting comfort. If the hunter plans to sit extended hours or multiple days, a fully adjustable ground blind chair will be a better solution for the hunter. The interior of the ground blind will have one or more wall pockets to store small items and hunting accessories in while in the ground blind hunting. Some ground blinds offer a bow hanging system. Other ground blind accessories are available on the market to allow hunting gear to be accessible; window shelves, bendable hanging strips for a bow or light source, and hooks. The placement of ground blinds is always important for a successful hunt. It is important to strategically place the ground blind where there is a wide angle of view and where the hunter will have the advantage of the best shot opportunity. It is not as critical as to brushing the ground blind in and the length of time the ground blind has been placed before commencing to hunt in the blind when turkey and hog hunting. Turkey and hog do not seem to be as leery with new ground blind placements, and often hunters are successful with a shot opportunity on the same day the ground blind was placed. With deer and other large game, it is critical to place the ground blind inconspicuously by brushing the ground blind in to the surrounding area, all the while keeping in mind the placement for the highest shot opportunity in direct correlation with the way the game being pursued is using the area. Many ground blinds will feature a way to secure limbs to the exterior of the blind for brushing in with limbs; either with ties or banded straps. It is helpful to keep in mind where the sun will rise and set to keep from placing the ground blind where the hunter will be looking directly into the direct sun interfering with hunter’s shot. Ground blinds will come with ground stakes, and most will include nylon tie-down cords. It is always good practice to tie down the ground blind, especially if the blind will be left unattended for any length of time or on windy days. Most ground blinds will include a zippered carrying case with straps for carrying comfort and convenience. Often these carrying bags will have a pocket to store the ground stakes and rope in. With most of the ground blind bags, the main zippered compartment can accommodate a small folding stool. Setting a ground blind up against a tree line, dense brush, cedars, hay bale, or some other object will allow the blind to blend in. Windows should be opened only to the width to safely make a shot with the weapon being used. Pay attention to the side or back windows because a see-through silhouette will be visible to game animals approaching from the sides of the ground blind. One of the first things recommended once you select a ground blind is to erect the ground blind outdoors, spray down the exterior with an anti-UV spray, paying the most attention to the roof and three-quarters of the way down the exterior walls. This anti-UV spray will protect the color and finish of the exterior of the ground blind. After the anti-UV spray has been applied per the manufacturer’s instructions and has dried completely, a water repelling spray should be applied to the entire roof and the portion of the ground blind that would be likely to leak; typically to the top of the windows. This treatment will assist in repelling water. For seams and stitching holes, shoe goop can be applied to those areas sealing the holes from leaks keeping hunters and gear dry inside. Shoe Goop is a rubber type adhesive that dries to a pliable finish on nylon, canvas, plastic, and rubber. Make certain all areas applied are completely dried before folding down the ground blind for storage. If it is ever necessary to pack the ground blind in the field wet from rainy weather, it is imperative to erect the ground blind for drying as soon as possible after the hunt to inhibit mold and to keep the blind materials from deteriorating. If the weather is not cooperative to set the blind up for air drying within a 24-48 hour period, the ground blind should be taken out of the carrying case and any water found should be wiped away with a dry towel. If the ground blind zippers get mud in them, the zippers should be rinsed well with water by a direct stream of a water bottle with sprayer or spritzer top and dried off. If you find that the zippers are hard to zip and unzip, you can use unscented bar soap or a glycerin bar on the zipper teeth allowing the zipper to glide easier. If a hunter is traveling to hunt public or private land, it is always a good idea to load a ground blind up for the trip; you may find the perfect hunting spot that does not work well with a stand. If unexpected weather arises, a ground blind could save the hunt. Utilizing a ground blind while introducing a new hunter or youth hunter to hunting; allowing more concealment and giving the mentor the option of to assist a youth with the shot. Erecting a ground blind will offer a hunter a viable solution in saving the hunter valuable hunting hours versus taking the time to erect a stand. There are many reasons to consider a ground blind for hunting that far outweighs the small inconvenience of carrying the ground blind in, setting it up, brushing it in, and having to take it down after the hunt. Adding a quality ground blind to a hunter’s gear inventory will prove to be a wise investment for a practical, viable solution for hard to hunt areas, high traffic areas not suitable for stands, when extra concealment is necessary, or cover for those days with not so favorable forecasts.